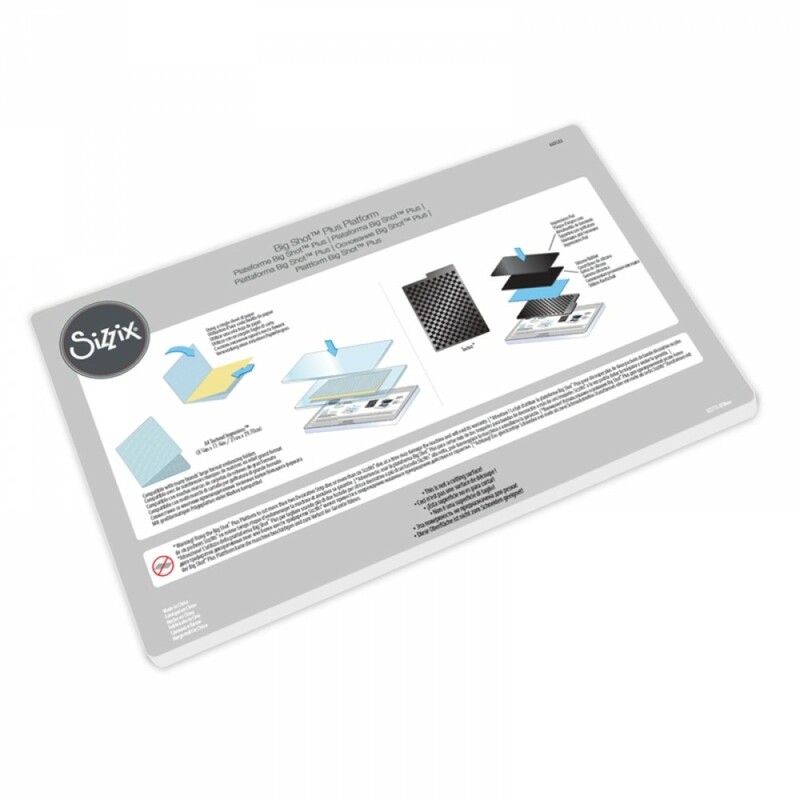 The Big Shot Plus Machine measures approximately 15.75" x 11.75" x 7.5"
The Big Shot Plus Standard Cutting Pads measure 8.75" x 6.125" x 0.125"
The Bigz L die platform measures 8.5" x 6" and contains dies ranging in size from 1" x 1" to 4.5" x 3"
The Basic Shapes Thinlits vary in size from 0.5" x 0.5" to 11" x 8"
The Textured Impressions A4 Embossing Folder measures 8" x 11.5"
The paper pad measures 6" x 6"
The Craft Asylum A4 Paper Starter Kit measures 8" x 11.5"
The Sizzix Big Shot Plus Machine Starter Kit is here to make all your die-cutting and embossing dreams come true! 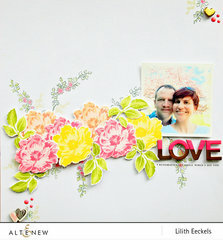 And what a great way to get started die cutting and embossing on a large scale! Fun papers in a variety of patterns and sizes, fun dies in shapes of butterflies, hearts, flowers, a scalloped border, gift tag and more, and a big, fun spotted embossing folder. Our favorite is the mini treat box die that can be used year round for gift giving and homemade treats! Big Shot Plus Details: This machine is everything that you love about the Big Shot with the added versatility of using 8.5" x 11" materials! 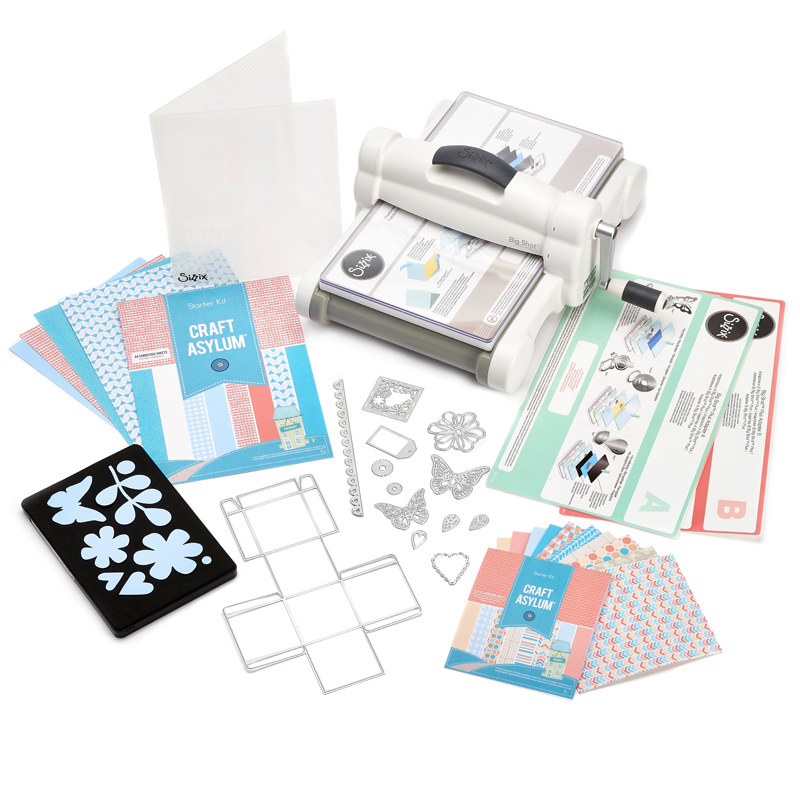 The Sizzix Big Shot Plus Machine is a beautiful, sleek, and stylish machine, sure to impress anyone who sees it proudly displayed in your craft room! Designed with style and power in mind, this white and gray machine with a fancy embossed carrying handle has solid core steel rollers and solid steel gears. That means it doesn't just get the job done, but it also looks great while doing it! 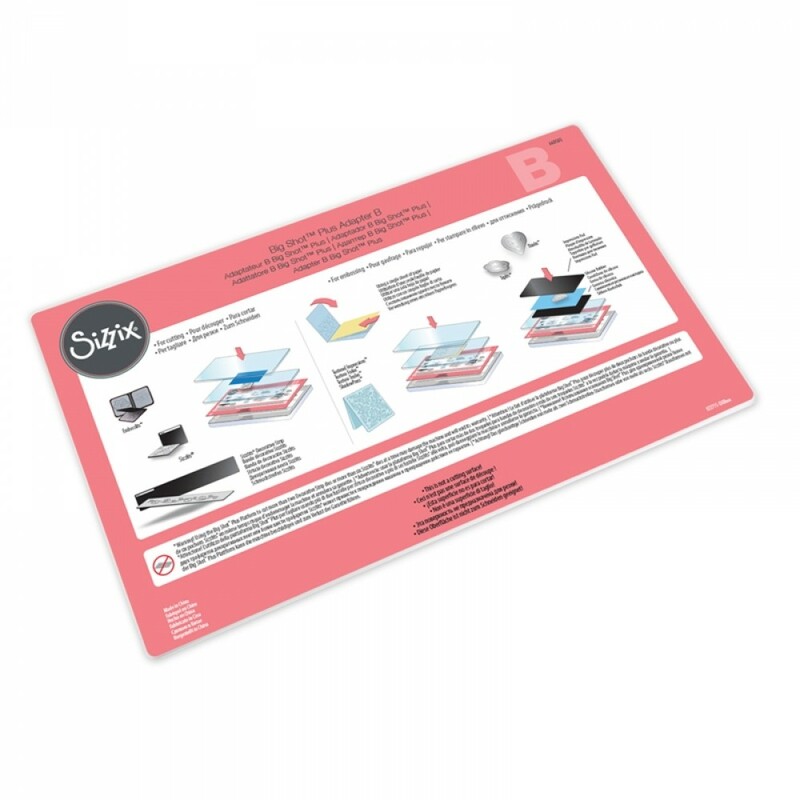 And it's compatible with the entire Sizzix product library (with the exception of Bigz Pro dies). You can create cards, announcements, gift tags, treat boxes, goodie bags, gift card holders, invitations, scrapbook pages, banners, home decor, fashion accessories, magnets, ornaments, and many more fantastic projects with your die cuts! With its 9” wide cutting path, you can use the Big Shot Plus with everything from large 9"-wide plastic-backed dies to the smallest thin metal dies. For more efficient cutting, use the Big Shot Plus’s large cutting area to cut multiple smaller dies in a single cutting pass! And of course, the Big Shot Plus will also emboss, score and crease as well (accessories may be required for these tasks). 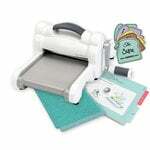 NOTE: Just in case you aren't totally sold on this amazing machine and bundle of goodies, you can compare the Sizzix Big Shot Plus with other top-selling die cutting machines using our handy Die Cut Machine Comparison Chart. How to Use the Big Shot Plus: To use the Sizzix Big Shot Plus with a steel rule die, place the die between a pair of cutting pads with the paper face down over the part of the die design you would like to cut. If needed, use Washi or masking tape to secure the paper in place to get the perfect placement on your paper. Set the die and pad “sandwich” on the cutting path of the Big Shot Plus machine, and turn the crank to move it through the machine. 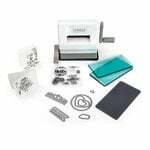 To use the Sizzix Big Shot Plus machine with a thin metal die, you'll need to use the included Big Shot Plus Platform with adaptor A (or the Sizzix Magnetic Platform) as well as a set of cutting pads, also included. To create your die cutting “sandwich”, begin by placing the platform on the bottom with the adapter on top of it. Next, place the first cutting pad on top of the stack. Then, place your paper right side up on top of the cutting pad. Place the thin metal die on top of the paper, with the cutting edge down (in contact with the paper). Finish the sandwich by placing the second cutting pad on top. Set the die and Sizzix pads “sandwich” on the cutting path of the Big Shot Plus machine, and turn the crank to move it through the machine. The possibilities are literally endless when you use your Sizzix Big Shot Plus machine with thousands of thin metal dies, steel rule dies, embossing folders, and more that will bring projects you've only imagined in your dreams to life! 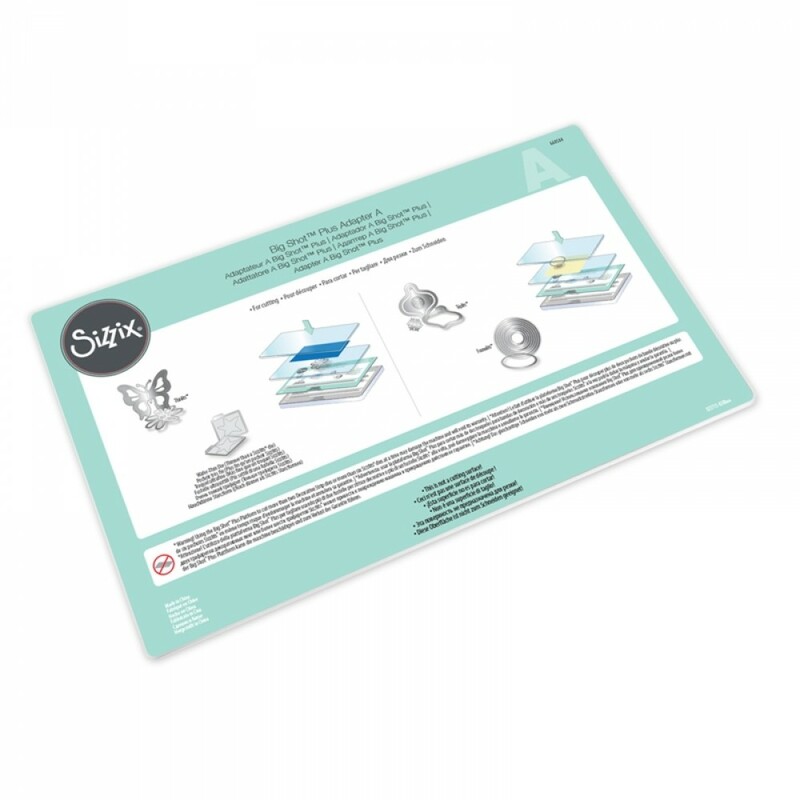 TIP: The Sizzix Big Shot Plus machine’s polycarbonate plastic cutting pads often make loud creaking, cracking, and snapping noises while being cranked through the machine. This is no cause for alarm! This is a normal part of machine operation and the cutting pads and machine are designed to withstand the pressures of cutting. The pads may even show outlines of your dies after use - do not panic! This is totally normal as well! To extend the life of your cutting pads, flip them over periodically. I'm enjoying trying out a little bit of everything that this machine can do. What a time saver. I really wish that the sizzix sandwich book came with it Short on instructions and looking for answers on line can be time consuming. This is the biggest reason why I didn't give 5 stats. I love my new Big Kick exspecially the wide table. I was well pleased with my Sizzix cutting machine. Got it sooner than I expected. Wait a long time to be able to upgrade to this product, I do like how it works, just about wore out my smaller old one. Wish it came with accessories that were full size !!!! That I ordered at the same time. Glad I got the Starter Kit. 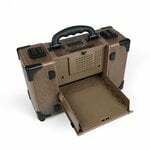 You will need all the additional adapter thicknesses to run all the different dies. I love my Big Shot Plus! I have only been working with my Cricut, which I was very happy with, but it was getting tired so I thought I’d try the Big Shot. I originally wanted the express, which is electronic, but it wasn’t available anywhere. I decided to try the Plus. Great choice. Cut right through intricate dies using glitter paper. Sold me there! I would highly recommend. Love the machine. It's nice to be able to use some of my larger dies that just wouldn't quite fit in my Cuttlebug. My only complaint is the cost of any peripherals but I guess once a company gets you over a barrell, you're kinda stuck there. THIS IS A FANTASTIC PRODUCT. THE CUTTING DIES THAT COME WITH IT ARE REALLY GREAT. CANT WAIT TO GET SOME LARGER DIES AND EMBOSSING FOLDERS TO USE WITH IT. Greaat for both quilting and paper crafting. I purchased a Big shot plus and use it for quilting, My Granddaughter is into paper crafting so I purchased one for her and she loves it as well. The description on the page refers to a Big Shot Plus but the video presents a Big Shot with the bundle advertised for a Big Shot Plus, then which machine is the one being sold with the Starter Kit- White and Gray? Thanks. By: Gonzaga (15-Nov-17) Helpful Question? Yes | No Thank you! Report Inappropriate This question has been reported. Thank you! Yes it is the same machine. I have the big shot pro and purchased the bundle for my Granddaughter it is the same machine. By: leskoeb (16-Nov-17) Helpful Answer? Yes | No Thank you! Report Inappropriate This Answer has been reported. Thank you! 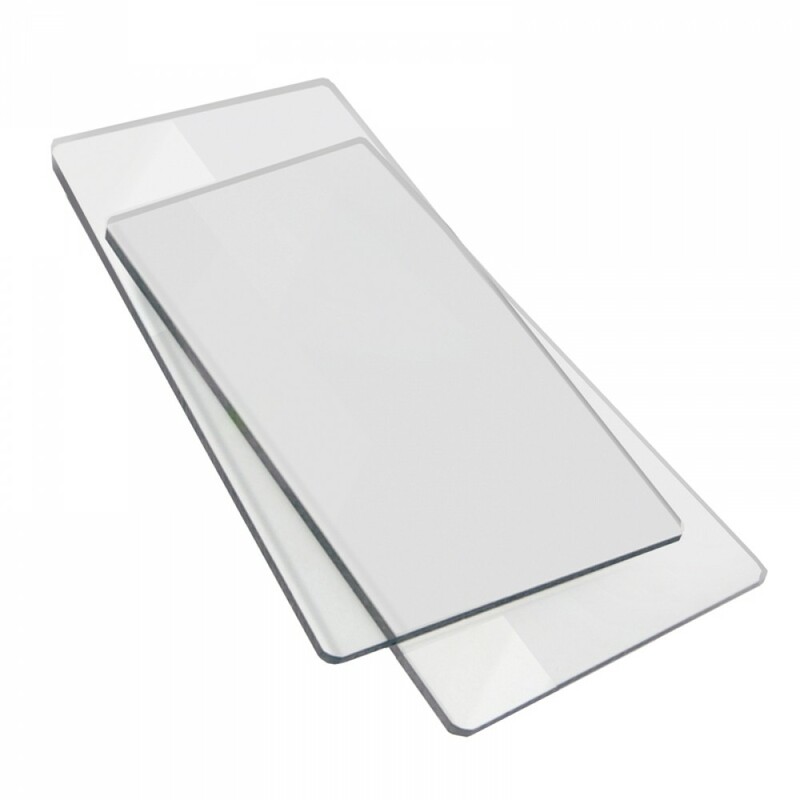 What is the width of the platform for cutting, I mean what is the maximum width that can cut? By: sonia.gm (06-Dec-16) Helpful Question? Yes | No Thank you! Report Inappropriate This question has been reported. Thank you! It's everything you love about the Big Shot - plus the versatility to use 8 1/2" x 11" materials! 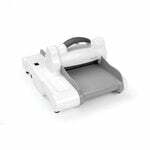 With a sleek white and gray color scheme and the Sizzix logo embossed on the handle, the Big Shot Plus Fabric Series Machine offers plenty of stylish appeal with the same versatility of working with the entire Sizzix product library (with the exception of Bigz Pro dies) - including our smallest to our big 9" wide dies and embossing tools. By: Janna L (07-Dec-16) Helpful Answer? Yes | No Thank you! Report Inappropriate This Answer has been reported. Thank you! Does the Big Shot Plus come with the multi-purpose extended platform and extra thick shim for flower shaping molds? If not, which model does? I was told that the Big Shot does and so if both Big Shots are the same except for the width I wonder if this also is a feature of the Plus. If not can the extended platform and extra shim be ordered separately? By: Dianalynn24 (14-Feb-18) Helpful Question? Yes | No Thank you! Report Inappropriate This question has been reported. Thank you! Wide work surface with larger format accessories. The site tells you exactly what Big Shot Plus offers. By: babyfirst (16-Feb-18) Helpful Answer? Yes | No Thank you! Report Inappropriate This Answer has been reported. Thank you! I am deciding between the Big shot plus and the big shot pro. I am a rag quilter. How many layers of flannel squares can I cut with both machines? By: Jupitermap (25-Jan-18) Helpful Question? Yes | No Thank you! Report Inappropriate This question has been reported. Thank you! One layer By: carrie Doty (01-Mar-18) Helpful Answer? Yes | No Thank you! Report Inappropriate This Answer has been reported. Thank you! what magnetic platform works with big shot plus? By: paintky (07-Sep-16) Helpful Question? Yes | No Thank you! Report Inappropriate This question has been reported. Thank you! at this time there is only the standard and extended magnetic platforms available, both of with will fit in the BS Plus machine. There are plans to come out with a Plus size magnetic platform in 2017. By: Janna L (07-Sep-16) Helpful Answer? Yes | No Thank you! Report Inappropriate This Answer has been reported. Thank you!